PANAMA CITY, Panama, July 4, 2012 (ENS) – South Korea startled International Whaling Commission delegates today by announcing that the country plans to start “scientific” whaling off its shores. Head of the South Korean delegation, Kang Joon-Suk, told the commission’s annual meeting in Panama City that his country would submit a research whaling plan to the next meeting of the IWC Scientific Committee next year. South Korea stopped whaling in 1986 in compliance with the IWC’s global moratorium on commercial whaling. The moratorium was imposed out of fear that a continuation of centuries of whaling would wipe out many whale species. The South Korean announcement opens a new battleground in the whale wars. Since 1987, Japan has been whaling under a provision in the commission’s rules that allow nations to conduct lethal research on whales, with the meat then being sold to consumers. Over the past three whaling seasons, anti-whaling activists have frustrated the Japanese whalers in the Southern Ocean, blocking and chasing their ships and forcing them early from their preferred whaling grounds with less than their self-assigned quota of about 900 whales. South Korean delegate Park Jeong-Seok told the IWC that while his country would submit its whaling plans “in the spirit of trust, good faith and transparency,” it was “under no obligation” to inform the commissioin in advance. An angry Gerard van Bohemen, New Zealand’s IWC commissioner, warned that a South Korean whale hunt would put whale populations at risk. Japan has not contributed to science after years of expeditions, he said. South Korean delegates said consumption of whale meat “dates back to historical times” in their country and that the minke whale population had recovered since the 1986 moratorium took effect. But scientific data presented to the commission Tuesday shows that the Antarctic minke whale population, at least, has not recovered and has declined by about one-third in the late 20th and early 21st centuries. The IWC Scientific Committee reported that total circumpolar estimates of about 720,000 minke whales were agreed for the period 1985/86 to 1990. By comparison there were 515,000 minke whales estimated for the period 1992/3 t0 2003/04, a decline of about 30 percent, which the committee said “was not statistically significant.” The committee is now looking at ways to determine if there is a true decline and if so, what is the cause. 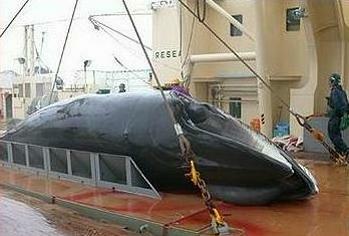 The South Korean announcement came after Japan appealed to resume whaling along its coasts. This proposal has not yet been put to a vote. But Japan and its allies again successfully blocked a proposal for South Atlantic Whale Sanctuary. The vote came on Tuesday, the opening day of commission’s annual meeting. Presented by the governments of Brazil, Argentina, South Africa and Uruguay, the proposed South Atlantic Whale Sanctuary would cover the waters of the South Atlantic between the continents of South America and Africa. It would stretch from the Equator in the north to 60 degrees South latitude, at the boundary of the Southern Ocean Sanctuary. To be adopted, the proposal required a three-quarters majority of those voting. It was defeated on a vote of 38 in favor and 28 opposed, with two abstentions. ?”We are extremely disappointed that the whaling bloc has harpooned the Sanctuary proposal despite support of a clear majority of IWC member countries voting here,” said Patrick Ramage, director of the nonprofit International Fund for Animal Welfare’s Global Whales Programme. While Japan, and now South Korea, disguise their whale hunts as “research” Norway and Iceland have opted out of the moratorium and conduct whaling as they see fit. Now Denmark and its territory Greenland may join their other Northern countries. Today Denmark/Greenland presented the commission with a proposal for hunts of minke whales, fin whales, humpback whales and bowhead whales.